Today's refugee protection regime, established in the aftermath of World War II, is ill-equipped to meet the protection needs of contemporary displacement situations. Recent crises in Syria, Yemen, the Central African Republic, Iraq, and elsewhere have put the international protection system under unprecedented strain, with numbers of displaced people at highs unseen in decades. At the same time, strengthened border security in prosperous countries has left few legal channels for forcibly displaced people to enter their borders to apply for asylum, work, or join family members—making dangerous irregular migration the only option for many. While there is no reference to humanitarian assistance in the 1951 Convention relating to the Status of Refugees, this has become the default response to refugee crises—with limitations that are now inescapably clear. The governments of western industrialized countries are spending huge amounts of money on systems that are not producing the results—in terms of safety, security (both personal and national), protection of human rights, and economic advancement—desired by their citizens as well as by displaced people. This report explores the main sources of strain on the existing system of protection, and examines the two most promising avenues for strengthening the system: development- and mobility-focused approaches. It makes the case for a robust, cooperative international effort to go beyond humanitarian assistance and incorporate new tools and new channels for the protection of the displaced. 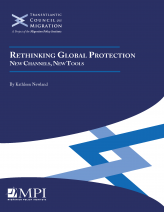 As the report argues, two new approaches in particular have the potential to refit and reinvigorate the protection regime. One involves integrating development programming with the traditional care-and-maintenance models of protection to empower refugees to use their skills and energies to provide for their own livelihoods, by granting them the right to work—in cooperation with host communities. The second approach would open channels of international mobility that might include labor migration schemes, family reunification with relatives already settled elsewhere, and international study and training programs, which would help refugees achieve both security and self-sufficiency. Incorporating development and mobility approaches to protection into international cooperative efforts could prove to be an effective way to create a more sustainable and dynamic response to forcible displacement.